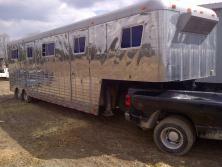 The Horse Limo was started in 2009, by Michele (Mitch) Hampshire. Michele (known as Mitch) came to Canada in 1998 from Europe, armed with both B.H.S and H.N.D qualifications and experience in both competing, breeding horses and the care and management of horses. Mitch opened and ran the successful boarding and training facility known as Kingscliffe Equestrian Centre, in Caledon East, and became a Canadian citizen soon after. With the help of some good friends with their input and advice, Mitch sourced a Bellamy Trailer in Florida, and so the adventure began. !